“Profound” is how Captain Richard Champion de Crespigny described the significance of A380 VH-OQA Nancy-Bird Walton’s return to the Qantas fleet. Qantas’s first Airbus A380 and hence the symbolic flagship of the airline’s fleet, VH-OQA returned safely to Singapore under Captain de Crespigny’s command after an uncontained explosive failure of its number two Rolls-Royce Trent 900 engine soon after takeoff when bound for Sydney on November 4 2010, operating flight QF32. “The aircraft was challenged in an incident that is not part of the certification requirement. It was extensively damaged, we were operating outside the protected environment provided by certification standards, and we were on our own,” Captain de Crespigny recounted to Australian Aviation in April 2012 (for this feature article which was originally published in the June 2012 issue of Australian Aviation – Ed). 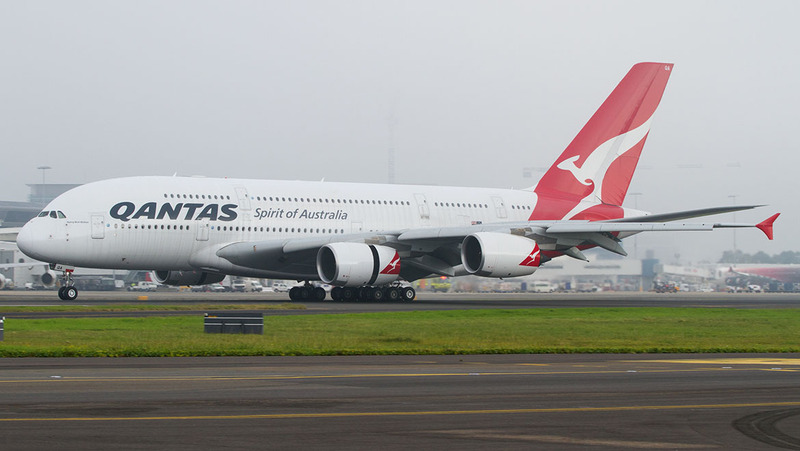 At about 9.20am on Sunday, April 24 2012, Nancy-Bird finally came home, touching down in Sydney and symbolically completing her QF32 flight from Singapore – an exclamation mark on the most significant air safety event and the culmination of the most extensive and expensive aircraft repair in Qantas’s modern history. 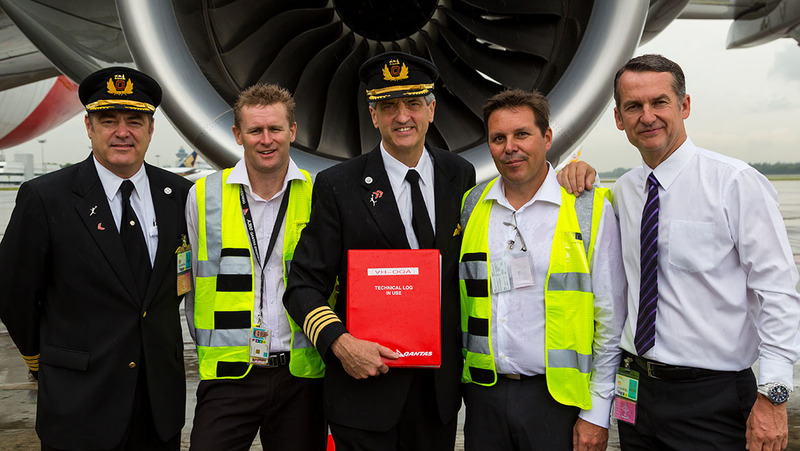 “The QF32 was one of the biggest events of its kind that Qantas has gone through. It was significant for the damage done to the aircraft and I think for how the whole organisation handled it,” Qantas CEO Alan Joyce says. Even before Captain de Crespigny, his crew and passengers had landed safely back in Singapore, Mr Joyce and the Qantas executive team had taken the momentous decision to ground the airline’s A380 fleet, a decision unprecedented in Qantas history. “Grounding the aircraft showed we were never going to put commercial concerns ahead of safety. It was absolutely the right call, looking back in hindsight, and it was made extremely fast on the day,” he tells Australian Aviation. That successful landing and disembarkation brought the QF32 incident to a happy ending, and meant the process of assessing, repairing and returning to service Nancy-Bird could begin. “Repairing this aircraft was probably the biggest repair job in aviation history,” says Mr Joyce. For the crew of QF32 the true magnitude of the damage endured became apparent once they were able to inspect the aircraft after the passengers had been deplaned and number one engine was finally shut down. But for then head of Qantas’s Maintenance Operations Centre Alan Milne and now chief of its Integrated Operations Centre, who would oversee the aircraft’s subsequent repairs, the real moment was when Qantas maintenance manager Tim Gent arrived in Singapore very soon after the event. The damage he saw is starkly described by the ATSB interim report into the incident: “The failure of the number two engine ejected a number of engine components that struck the aircraft or were liberated overboard. “Sections of the intermediate pressure (IP) turbine disc penetrated the leading edge of the left wing inboard of the number two engine, resulting in damage to the leading edge structure, the front wing spar and the upper surface of the wing. “A small section of liberated turbine disc penetrated the left wing-to-fuselage fairing, resulting in damage to numerous system components, the fuselage structure and elements of the aircraft’s electrical wiring. Released debris also impacted the left wing’s lower surface, resulting in a fuel leak from the number two engine fuel feed tank and left wing inner fuel tank. “Other impact damage was observed to the number two engine support pylon, the number one engine, the left fuselage keel beam support splice and the left wing false spar. A small impact region was also observed on the left side of the aircraft’s fuselage. The result was the most extensive and expensive repair in Qantas history, bigger than the repairs to 747-400 VH-OJH which as QF1 overran a wet runway at Bangkok in 1999. Planning for Nancy-Bird’s repairs began almost immediately she was back on the ground. Airbus executive vice president customer services Didier Lux emphasises that an aircraft repair of this magnitude is not something left to chance: “It is a really functional approach done [in partnership] with the expertise of Qantas. The result is this aircraft, I would say, is as good as a new one. The next step is production of the parts. As soon as the repair is defined, parts are ordered and made and job cards are prepared for the repair team in Singapore. 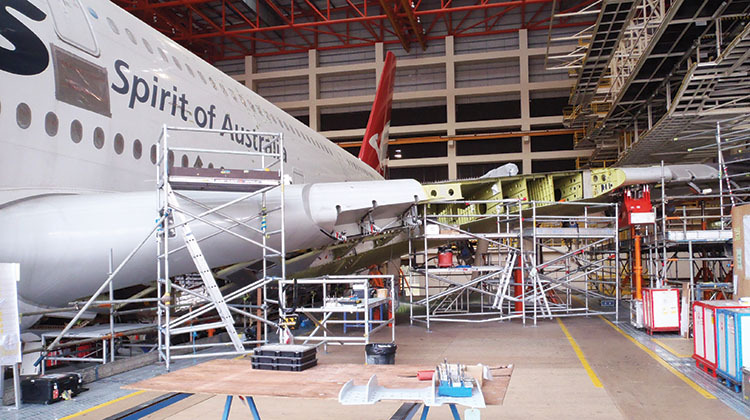 While Airbus was responsible for the design and implementation of the repair work, the aircraft remained in Qantas ownership throughout the process and as such oversight was governed by CASA requirements and the Qantas AOC. As such, Qantas’s maintenance controller, who under the terms of the AOC is the one person accountable for all the maintenance on the Qantas fleet, ultimately is responsible for any issues with and oversight of the repair. 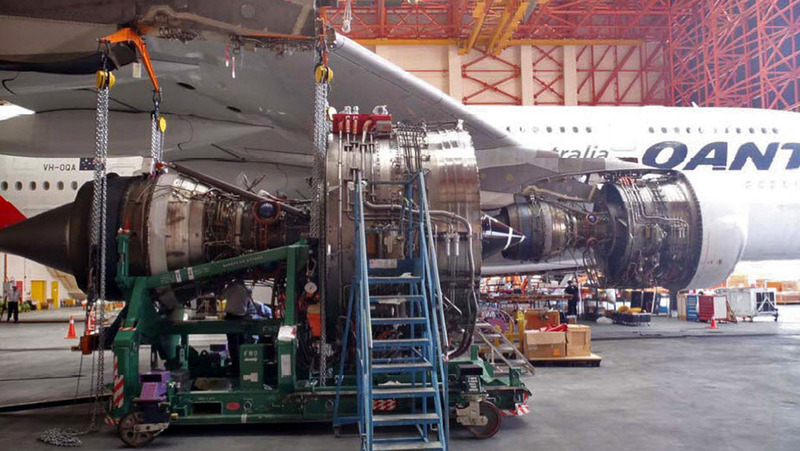 Consequently, the maintenance controller appointed Qantas engineering personnel to work with Airbus on the design and implementation of the repair. “It was a collaborative effort. It was not Airbus saying ‘this is what we are going to do, see you later’. They were sitting down together, they were discussing it, saying ‘maybe that is the best option here’. They were deeply embedded in the whole process,” Mr Milne says. CASA also sent inspectors to Singapore on a number of occasions to inspect the repair work as part of its oversight role as regulator. The repair process began with assessment of the damage and repairs needed and, with Qantas, determining the repair methodology to be used. The assessment process ran for six weeks over Christmas-New Year 2010-11, once regulatory and investigatory authorities such as the ATSB had released the aircraft. The result was that the aircraft was deemed to be economically repairable but that temporary repairs were not viable and it would have to repaired in situ in Singapore. Thankfully, Singapore’s Changi Airport is home base for Singapore Airlines’ A380 fleet, and SIA Engineering made available its own A380-capable hangar for the repair work. “The facilities available to us were remarkable,” Mr Gent notes. Airbus proposed its repair plan for Nancy-Bird in February 2011 and by April agreement had been reached with Qantas on how to proceed. One of the key challenges was the need to jack up the aircraft on jigs to bring it a zero g state, as it was in the Airbus factory during production, so there would be no undue stress on the wing during the repair. “It was clear we needed to get the aircraft back to an almost factory condition to enable the scope of repairs,” Mr Blackham says. That meant the first jigging of an A380 outside of the factory, which put in train a major logistical effort to ship jigs from Europe, including some tooling that had to be specially made for the repair. Over 40 tonnes of tooling and jacks were shipped via two sea freight shipments supplemented by over 1,000 airfreight deliveries of replacement spare parts. In all, Nancy-Bird spent 116 days on jigs in SIA Engineering’s A380 hangar between July 6 and October 22 2011. During that time the damaged area of the top wing was replaced by a custom-designed patch, while a new lower wing skin panel and replacement section of the forward spar – this is built in sections so the damaged section was simply replaced with a new-build spar section – and a new number two engine pylon were fitted. 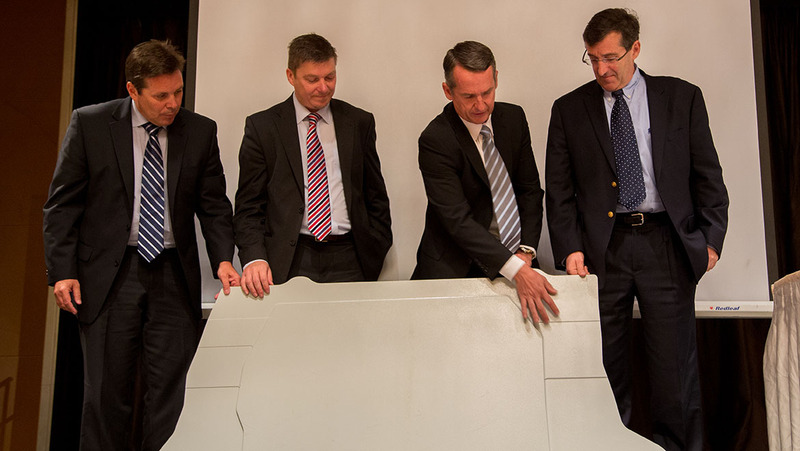 Indeed, Mr Blackham remarks that the repair patch panel was a “phenomenal” piece of engineering on the back of a “huge” effort by around 40 Airbus engineers in the UK, where the A380’s wing was designed and is built. 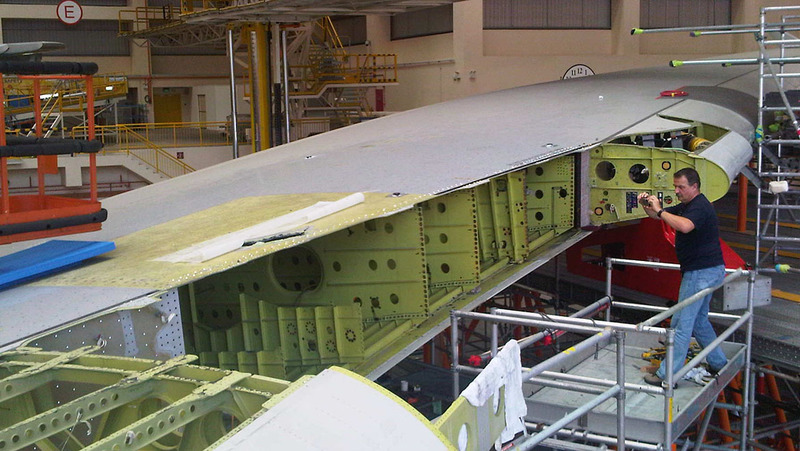 A dedicated three-dimensional laser scanning tool used for a repair for the first time, allowed detailed measurement of the wing’s profile to ensure the patch exactly fitted the profile of the wing as originally delivered. Interestingly, one of the repair’s contingencies was building repair components, including the upper wing patch, in duplicate, in case of error or something happened during the rebuild. While the upper wing patch was the most technically difficult element of the repair, seeing the forward wing spar section removed was perhaps the most arresting aspect of the work. “Fortunately the front spar is built in sections, so we could de-bolt existing wing joints, take out the old front spar section and replace it with a completely new part, which had to be specifically machined to accommodate the top wing skin,” Mr Blackham says. 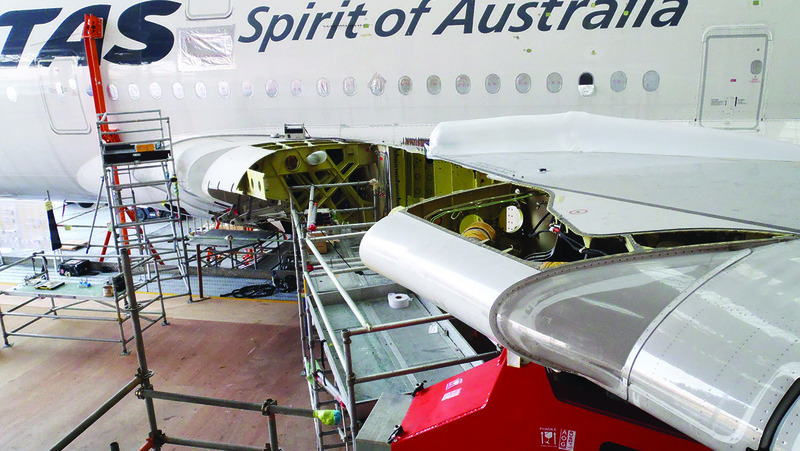 “Seeing an A380 with the forward spar removed is just unbelievable,” Mr Gent remarks. Damaged systems and wiring were also replaced – including 5km of new wiring harnesses – while all four engines were replaced with new ones. Once the A380 was rolled out of the hangar to allow Singapore Airlines to conduct its own routine A380 maintenance, work continued initially in the open or in another Singapore Airlines hangar. This included fitting new flaps and fairings, then systems checks, taxi tests and ultimately, flight tests. “The testing has been outstanding. All systems came back to life as expected. We preserved the aircraft very well from the event,” Mr Gent says. “The aircraft is now back as good as new. That’s the way we planned it,” adds Mr Blackham. In all, the repair involved over 70,000 production and 50,000 design hours. Further, the repairs added less than 100kg in extra weight to the aircraft, a tiny amount compared to the A380’s 560 tonne maximum takeoff weight. With the repair work completed, taxi and flight testing followed, with acceptance testing following procedures designed for new build aircraft. That “shakedown process” took place over two weeks in April and even though system testing takes place as part of the final repair process, “we come in from zero, with an objective that checking that all the systems come up, that they work correctly and you can immediately transition to the operational handling of the aeroplane without any failures”. This means testing electrical modes, the ventilation system in the avionics bay, the air conditioning system and APU runs. As Nancy-Bird’s APU had been removed during the repair process, as well as all four engines, “we were interested in seeing how the system would run off the APU”, Mr Daws says. The static test phase saw 120 test points checked off before engine runs began. In all, ground testing took place over eight days, three days of which the aircraft was unavailable for testing while its repaired areas were repainted. By April 14 it was ready for taxi tests around Changi Airport, during which steering and braking were tested in normal and backup modes, and culminating in a rejected takeoff test. Given carbon brakes can be affected by moisture ingress, one of the technical concerns was being sure the brakes worked as required, so repeated brake applications ensured the brake packs heated up to dry them before the aircraft lined up on the runway for the rejected takeoff. The way was now clear for the first technical flight on April 15. 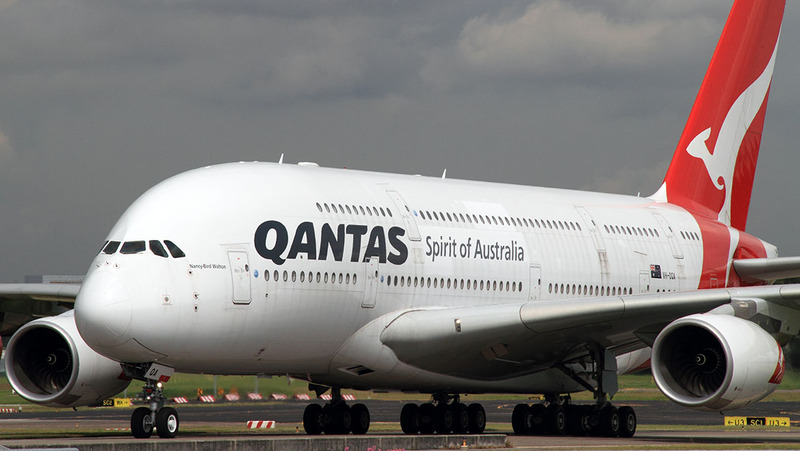 As the aircraft is owned by Qantas, pilot in command for the test flight (as well as the taxi and rejected takeoff tests) was Qantas A380 technical pilot First Officer Ben Holland, with an Airbus flight test pilot beside him and two engineers onboard. The extensive four-hour flight testing was largely done in a block of airspace 60nm east of Singapore, where the A380’s operational envelope could be validated. Checks included flying at up to 70 degrees angle of bank to check bank angle protection, pitching up and down to create bending moments in the wing and flying to the aircraft’s 43,000ft certified maximum operating altitude, high-speed cruise, an overspeed on descent to test emergency activation systems, a series of engine shutdowns and restarts, both using APU assistance or only the natural airflow to restart the engines, checking for sufficient fuel flows when the fuel pumps are switched off, hand-flying the aircraft and hand-controlling the thrust to check the aircraft’s low-speed handling when flight envelope protection systems are deactivated, flap overspeed warnings are checked, alternate gear extensions performed and an emergency electrical generator test. On return to Singapore a low-level go-around was performed to check the triggering of flight envelope protection systems. “We completed that and came back and after four hours and 20 minutes did an automated landing. And throughout it all the aircraft performed superbly,” First Officer Holland recalls. A subsequent, briefer validation flight evaluated the aircraft cabin systems such as galley and IFE operation before Nancy-Bird was able to depart for Sydney late in the evening of April 21. Extensive repairs are expensive. The direct, $139 million cost of the repairs covered by Qantas’s insurers, was significantly below the insured write-off value of the aircraft. But there were other costs to Qantas due to the subsequent grounding of its A380 fleet and the brand damage that comes from a major air safety incident. In the end, Rolls-Royce reached a financial settlement with Qantas of $95 million to cover those costs and disruptions. Mr Joyce says: “Grounding the fleet for 20-odd days, not flying it to LA until January two months later and then the ongoing maintenance requirements of swapping 17 engines, and then this aircraft being out of service 18 months – we estimated at the time that was $80 million, and [from the $95 million] there was a contribution towards the brand damage and the recovery of the brand. But clearly the return of Nancy-Bird is not just about dollars and cents. For his part, Captain de Crespigny says he followed the progress of the repairs to VH-OQA intimately, and that “you can’t help not” have an emotional attachment to the aircraft. “Because the passengers came out of the terminal so happy and the aircraft survived so well, no-one immediately appreciated the scale of the damage. Indeed, many pilots later told me ‘what’s the big deal – it’s just another engine failure’. But the closer you got, the more you became awestruck about the level of damage. Every person who became involved with the repair, when they first get close enough, stopped, went silent then just said ‘Wow’. They understand how well the aircraft performed, how well all the teams performed, and they were proud and privileged to be part of the teams that brought Nancy-Bird back to full health. First of all i must congratulate the crew of the Qantas plane for getting the plane back on the ground safely, one assumes it is all in a days work, but that was an exceptional incident and was not a normal days work. I always wonder why the passengers were not deplaned at an earlier time then what they were, if i was in the plane i would want to get out as quickly as possible, especially as i think there was a high risk of fire. Wayne , combustible aviation fuel was still leaking and flooding tarmac areas. Check “QF 32 ” a personal autobiography of the incident. Whatever happened to the damaged wing sections? Part of Australian aviation history now. Excellent work by the manufacturer, the airline, the flight crews, and all the technical teams involved in the repair, and subsequent tests, culminating with bringing back this awesome aircraft into service. This is the kind of combined effort which produces this remarkable result, and gives the flying public total confidence in the professionalism found in the commercial aviation industry. This just proves that we all can rely on Qantas to get us to where we want to go safely. Well done Qantas. You have had me as a customer for my entire life and I never intend to change that. And this is one reason why I’ll always choose the A380 over the 787 for longhauls! It’s a beast of an airplane that has proved itself. And it has 4 engines. I’m not in aviation but when you’re spending so many hours on these long hauls over oceans, I just feel so much safer with that much redundancy built in. If you read the Captain’s auto-biography, you will better understand the critical situation immediately the aircraft stopped. Avgas gushing from ruptured wing tanks, an engine that couldn’t be shut down and wheel brakes on fire at an estimated 1100 deg. C. ? Great article. Waiting for the print version of your fine new version of the mag. Does anyone remember the Boeing assisted repairs to a B727 involved in a takeoff collision at Sydney? Easy to critique at your keyboard. Job well done by the crew. I wouldn’t have evacuated straight up. They run on Jet A1, not AVGAS. The Qantas crew on the actual flight were remarkable having spoken to a passenger who was on that flight. What could’ve been Australia’s biggest transport disaster has become it’s finest hour. To the entire technical crew who put this fantastic plane back together , you’re amazing. I look forward to flying on her one day. 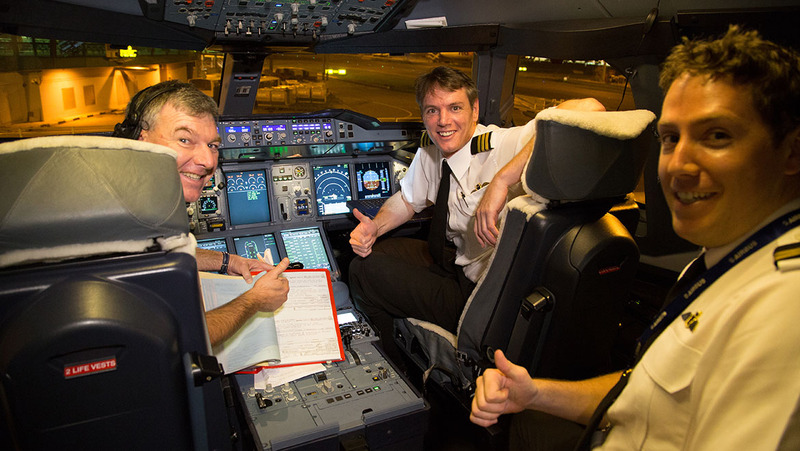 Crew training and engineering excellence is embedded in Qantas’ DNA. Never let the accountants change that. Folks , Australian Aviation Have Done Great Job. Had the privilege of flying to LHR in 2015 on OQA. If ever there was an aircraft that was really going to be safe, I knew it would be Nancy-Bird after all that meticulous work. To add to the experience, there was Richard De Crespigny leading his crew into action at Dubai for the final leg and he was very quick to point out into the flight that he had a special relationship with this aircraft (most on the flight would not have known what he was talking about) and that she was as tough and strong as old boots (my words). To top it all off, the air bridge at LHR failed to engage and Captain De Crespigny came down to great us at the door as we finally emerged after an extended delay. He has no doubt been congratulated and patted on the back thousands of times for the heroic work that day including his crew of course also, but it was my turn next in line to offer my humble congratulations, small words indeed. Great to be Qantas! Absolutelyamazing feat of accomplishment – of engineering, collaboration, project management. I am so proud of Qantas! I will continue tofly the A380 whenever I can, especially after reading this superb article of an over-engineered plane. I flew the A380 (upstairs) from Doha to Sydney only 10 days ago, and love the aircraft! Well done A380, and we’ll done Qantas to all!! My father was aboard VH-TJA – the 727 involved in that incident. At the time I was only 13 years old and didn’t appreciate just how close they came to disaster. Kudos to the flight crew for keeping their nerve – otherwise I would have grown up without a father. Vh-tja comments made me read the full accident report. Wow! Given this taxi back down the runway accident happened before the Tenerife catastrophe it seems lessons did not get learnt to avoid that runway collision. Thanks again Gerard for this insightful and full report. It shows the depth of teamwork required to design, build, certify, operate and repair the most complex machinery in high risk environments and deliver a level of service and safety that is unimaginable and the envy of other industries. In the US in 2013, one hospitalization has the same risk of accidental death as 70,000 one-hour commercial flights. There is so much more to tell about the environments the high reliability organizations operate in and how we do/don’t remain safe. After 4 hard years of work my next book on resilience comes out (in September) and providing culling the word count by half has not done too much damage, I hope it will show and give pride to the culture, systems, processes, people and human factors of the people who work in extraordinary teams to make aviation and other HROs safe. Hopefully most people will now have also reflected on the CEO’s decision to ground the A380 fleet after that flight – a decision in confusing times that was not replicated by other airlines that used the same engines. We must not discount the essential need for intrepid leaders who make decisions most others fear, and who set the culture that permeates the entire business. 8 years later, after having viewed many varied leadership styles in other companies and other industries, I, along with every other airline employee, remain proud to carry the torch of safety and to do whatever it takes to protect the lives of passengers and their loved ones. Passengers would want and deserve nothing less. Its an honor to fly and work with like-minded professionals in the world’s safest high-risk industry. I wish to mention also the outstanding contribution of the entire cabin crew, the excellent CRM and communication between the pilots and the cabin crew, as well as the efforts of the cabin crew who cared for the passengers and performed their safety duties during the unfolding emergency and subsequent safe disembarkation of the passengers at Singapore Changi Airport. This is no easy task either, particularly when you talk about an aircraft the size of the A380, with two large cabins, twenty three cabin crew and about 450 people on board. It is during moments like this that the thorough training, professionalism and skills of crew come to the forefront of everybodies thinking and actions. It reflects the great training and safety culture this Company has displayed, trained and practised throughout its entire operational life. give it a break Ted. Qantas is just another airline. Would rather fly that other Australian flag carrier Virgin anyday.